Found on Turkey’s beautiful south-western coast, the Club Virgin Bodrum is a modern and stylish family resort having previously operated as an adults-only. Looking over the beautiful seafront and just over 1.5 km to the city centre, the 4-star Club Virgin Bodrum is well located for a relaxing Bodrum holiday as it also features its own private beach. Club Virgin Bodrum offers two types of accommodation for visitors and it has an abundance of on-site eateries and bars to keep everyone happy, while the all-inclusive nature of the hotel means that there is local and international food to satisfy all travellers and the Club Virgin Bodrum also has an array of facilities from table tennis to diving with a variety of focused activities for children starting this summer. Entertainment is on at night including shows, live music and a mini-disco. You won’t even need to leave the hotel grounds to get the sand between your toes as the Club Virgin Bodrum has its own private beach. The hotel is a convenient 40km from Bodrum Airport, which can be reached easily by coach and you can visit the city centre easily just 2 km away. There are two room type choices at the Club Virgin Bodrum. Hotel rooms can be found in the main building and the club rooms, which are spread across the grounds. Each features a modern air-conditioning system to keep you cool in the soaring Turkish temperatures, satellite TV, hairdryer and an en suite bathroom. The Club Virgin Bodrum also provides two free bottles of water in the mini-bar every day and they also come with a French balcony or a private terrace depending on what room style you choose. Club Virgin Bodrum has an all-inclusive food and drink facility where you can get meals throughout the day. 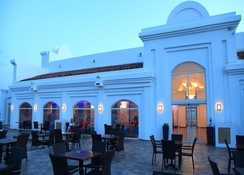 This allows guests to also enjoy one a la carte dinner during their stay at the Eagean Restaurant and there is a snack bar on site for any smaller meals. There are several bars at the hotel, which offer both alcoholic and non-alcoholic drinks and the lobby bar is open 24 hours while the relaxation area stays open to 2 am and the beach bar shuts up at 6 pm. The Club Virgin Bodrum has local and international food and drink options to suit everyone who visits. There is a lagoon styled pool that can be used by everyone at the Club Virgin Bodrum and the all-inclusive offer means that most of the facilities can be used free of additional charge. This includes entrance to the sauna, fitness suite and Turkish baths, sport activities such as beach volleyball and the gym while the Club Virgin Bodrum also has diving and other water sports on offer. The newly built playground and children’s club will keep the youngsters happy and the nightly entertainment will appeal to all ages during their stay at the hotel.